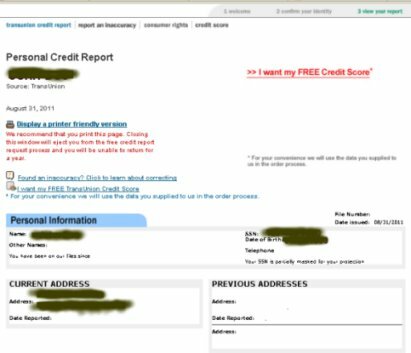 A while back I wrote an article on Step by Step guide to getting your free credit report. I've had several comments there from people who had problems getting their free annual credit reports via annualcreditreport.com Its hard to know why the some people would have problems. My assumption is that either they accidentally answered a security question wrong, or there is something broken for their account on the credit bureau side or there is actual credit freeze on their report for one reason or another. Recently one commenter said that only Experian works. 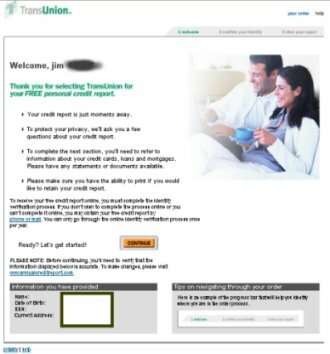 I decided to go ahead and get my report for Transunion to see if it worked for me. I had no problems getting my annual credit report from Transunion. I got the report yesterday August 31st, 2011. 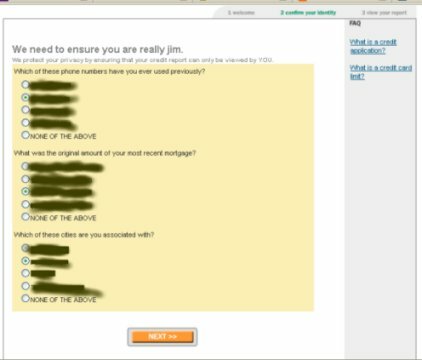 Some screen shots are below for reference and I've censored out my personal information. Second they ask you the security questions. This is a point that I think you can easily get tripped up and give the wrong answer. Unfortunately they seem to like to ask questions that can be confusing. Sometimes the answer is supposed to be 'none of the above' but you may not expect thats the right answer and give another answer that you think is close enough to right. They could also ask you a question that is confusing and vague. Today one of the questions they asked me was about the last mortgage I got. Well between my wife and myself we've got three mortgages so I didn't know if they only meant mortgages that I got myself or would they consider mortgages that my wife got? Luckily the answer was the same for either. In total the process only took a few minutes. Thankfully there was nothing bad or inaccurate on my report. I only got the Transunion one today. I like to get the reports from each bureau spread over several months. That way you aren't waiting 12 full months between checks. While the three bureaus store their data separately they do have the same information most of the time, so checking one will generally suffice to see if there is something you really need to worry about.